On Saturday night HBO’s Boxing After Dark kicks off the 2018 year for HBO with two world title fights on their network. 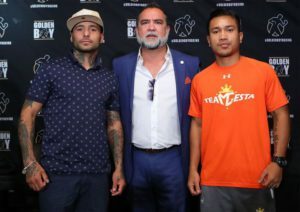 Lucas Matthysse will be facing off against Tewa Kiram for the vacant WBA “Regular” Welterweight title and Jorge Linares will face Mercito Gesta for Linares WBA Lightweight Title. This card will take place live at the Forum in Inglewood, California. The following is a preview of both world title bouts. The opening bout of the night will be between the very talented Jorge Linares and Mercito Gesta. Linares hit a rough patch in his career in late 2011/early 2012 when he suffered back to back TKO defeats, but has one every fight since then and will be making his sixth defense of his WBA Lightweight Title. Linares, at thirty two years old, is two years older than Gesta. He will also have a one inch height advantage and a one inch reach advantage. Linares lives in Tokyo and had a successful amateur background in Venezuela before turning pro. Gesta was born in the Philippines and currently lives in San Diego. He does not have the national amateur accolades of Linares. Linares has also been slightly more active than Gesta. Gesta fought twice in 2017 and did not fight in 2016. Linares fought twice in 2017 and once in 2016. Linares’ biggest question mark is his chin. He has three losses by knockout and they were to Juan Carlos Salgado, Antonion DeMarco, and Sergio Thompson. He usually starts his fights off strong but fades towards the end. He has defeated the likes of Luke Campbell, Rocky Juarez, Anthony Crolla, Ivan Cano, Kevin Mitchell, and Nihito Arakawa. Gesta does not have the professional resume of Linares. His lone loss was the Miguel Vazquez in his only title shot. He has defeated the likes of Gilberto Gonzalez, Miguel Mendoza, and Ty Barnett. Linares has good power in his hands and has stopped twenty seven of his opponents. Gesta only have seventeen stoppage victories to his credit. If Gesta was known for his power he would be a live dog in this fight. However, Gesta is not known for his power and was defeated quite easily when he last faced an opponent on the level of Jorge Linares. This will be the first fight for Linares on HBO in a long time, and it’s a fight that tailor made for him to look sensational in. The main event of the evening is between Lucas Matthysse and the relatively unknown Tew Kiram. Matthysse is from Argentina and is in the middle of a fourteen year career. Kiram is twenty five years old and ten years younger than Matthysse. Kiram turned professional at the age of fifteen. Matthysse had a successful amateur career and is a former Argentine National Champion and competed in several notable international tournaments. Kiram turned pro before most Americans can drive a car, but has never tasted defeat. Matthysse has incredible power in his hands and has stopped thirty five of his opponents and has only been stopped once. Kiram has twenty eight stoppage victories and won four of his past five fights by KO or TKO. Matthysse has not been very active and only fought once in 2017 and zero times in 2016. Kiram fought twice in 2017 and four times in 2016. However, every single fight of Kiram has taken place in Thailand. Matthysse has defeated the likes of Emmanuel Taylor, Ruslan Provodnikov, Roberto Ortiz, John Molina Jr., Lamont Peterson, Mike Dallas Jr., Ajose Olusegun, and Humberto Soto. His losses were to Zab Judah, Devon Alexander, Danny Garcia, and Viktor Postol. Kiram has no notable victories on his resume. It’s hard to pick against Matthysse in this fight when so little is known about Kiram. Matthysse’s inactivity is of concern, but he’s facing an opponent who has never faced someone on his level. Thai boxers can be surprising and are known for having incredible hearts. Kiram will need to display incredible heart and surprising talent to pull of the monumental upset.